It is a totally unpolished full- size khukuri used for jungle warfare and junkyard use. It is designed for rough use so no finishing is done on the blade. Also, the unpolished wood handle gives user better grip and easier to handle. It is the kukri for any serious hard worker to be used for trimming and chopping, hacking and whacking anything that comes in its way, specially clearing bushes in ones junkyard. It is called junky jungle as it similar to jungle except with a unpolished wood handle and with untanned leather. 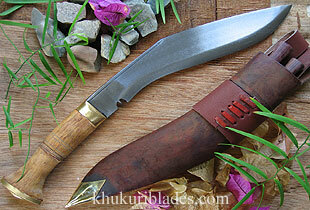 Jungle resembles the originality of a khukuri, as khukuris were not polished when they were initially made centuries ago. It is very famous among users because of its typical look and special feature. It is all-purpose utility knife.